From little Rittman High School in Wayne County to the Ohio State Athletics Hall of Fame, it’s been quite a journey for Matt Beaumont. 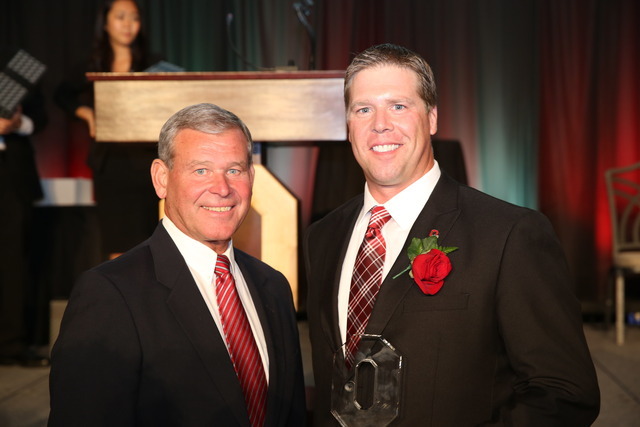 Beaumont, a 1991 Rittman graduate, was one of 14 members of the 2013 OSU HOF Class inducted during a dinner in Columbus Friday night. The honorees, who also included former basketball great Scoonie Penn, football coach John Cooper and wrestler Tommy Rowlands, were also introduced during halftime of the Ohio State-Wisconsin game Saturday night. When the OSU HOF committee looked at Beaumont’s numbers, they saw a pitcher who is among the best ever at the school. Beaumont ranks ninth all-time at Ohio State in strikeouts (245), 10th in wins (25), 13th in ERA (3.71) and 17th with 249 2-3 innings pitched. He was a three-year letterwinner for the Buckeyes from 1992-94, bursting on the scene by earning Big Ten Freshman of the Year. In 1994, Beaumont went 11-1 and led the Big Ten in strikeouts (104) en route to earning Big Ten Pitcher of the Year and first team All-America honors. He helped the Buckeyes win the Big Ten title and notched a win in the NCAA Tournament. “My biggest memories at Ohio State were winning the (1994) Big Ten Tournament championship and playing for it every year,” Beaumont said. Beaumont was selected in the fourth round of the 1994 MLB amateur draft by the California Angels and advanced to Triple-A before ending his minor league career in 2001. “I’ve started thinking back about my career because I had to write a speech and it really doesn’t seem that long ago,” said Beaumont, who was inducted into the Wayne County Sports Hall of Fame in 2002. “We just had our 20-year reunion for the 1993 team and I’m still great friends with a lot of those guys. Beaumont married his high school sweetheart, Carla (Ramsier), and together they have three children: Lauren, 10; Brady, 8; and Bryn, 2. The Beaumont family lives in the Columbus area and he’s a salesman for Stryker, a medical device company. The former Rittman great still keeps close tabs on the Indians, with nephews Ty and Todd Ramsier playing sports there now. His parents, Lynn and Bonnie, still live in Rittman, too. Rittman baseball coach Joe Staley, who came along at the school several years after Beaumont, said it’s a thrill for the current Indians whenever the former pitching great makes a visit. “The kids are in awe when he comes back to watch a game,” Staley said. “He’s really made Rittman proud and shows people what kind of things are possible. Aaron Dorksen’s weekly look at local, state and national sports appears on Sundays in The Daily Record. Dorksen can be reached at 330-287-1621 or adorksen@the-daily-record.com. Follow him on Twitter at @adorksenTDR.